You are reading page 5 of June 2018 Caption Contest: Poll - Select $100 Winner!. If you want to start from the beginning Go to First Page. 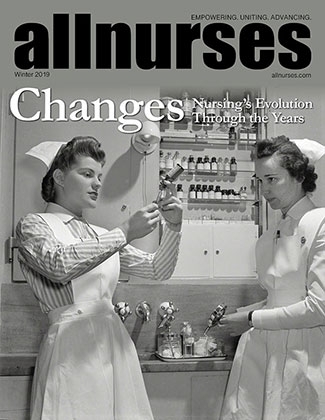 "At a time far ago," old people tell, "nurses had something they called breaks." "Those are some realistic looking Halloween decorations!" SarahHokieVT has 1 years experience. "Why is the nurses' breakroom abandoned?" "It's not. They just make it look that way so doctors stop stealing their food." "all right John, lets get to work changing this to a doctors' lounge!" anthonyrwhitehead has 2 years experience. "The closest thing to the break room is your imagination"
"There, now it looks haunted. We will definitely not have to worry about the nurses getting all jacked up on energy drinks!" "There is is Earl, this room is haunted. Not one nurse has entered. Must be some dark mojo in there." " The room of no presents, it been like this since the place was built." " What they don't know, this is actually just a door with a sign and no space. 20 yes and they ain't figured that out." Wile E Coyote drew this on the wall, it's a trick to catch the Road Runner.